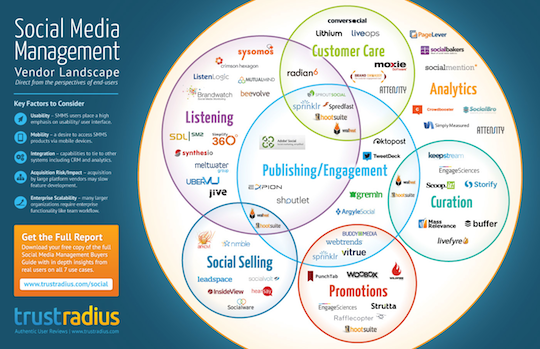 Struggling to make sense of the complex and fast moving social media management vendor landscape? Don't know which tools you should be looking at to engage in social selling or which ones you should use to track the effectiveness of your social campaigns? You're not alone. As social media has entered the business mainstream, evolving from a marketing experiment to an enterprise-wide imperative, social media tools have proliferated and many have greatly expanded in scope. Unfortunately, most of the coverage to date has grouped products that do very different things into a single view and additionally only covered a small subset of the the landscape. Please include attribution to blog.trustradius.com with this graphic. Want to learn more about each use case and hear the perspectives of users? Download a free copy of our Buyers Guide for Social Media Management Software (no registration required). For each use case, we highlight products in use, and also share high-level commentary about how well these products perform. I blogged about your new infographic on my site here: "Top social media management company list [INFOGRAPHIC]"